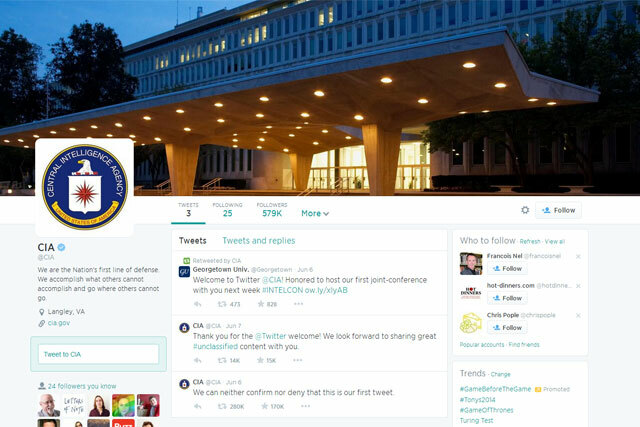 The Central Intelligence Agency (CIA), the US spying agency, has joined Twitter with a whimsical first tweet and has also set up its own Facebook page. Its first tweet joked "we can neither confirm nor deny that this is our first tweet" in reference to a popular response given to journalists, and the light-hearted tweet has been retweeted over 275,000 times. We can neither confirm nor deny that this is our first tweet. The CIA account, which already has over half a million followers, has sent a second tweet thanking people for the welcome to Twitter and stated it will share "great #unclassified content". It has also retweeted a tweet from Georgetown University promoting a joint conference between the spy agency and university. The Facebook account is currently significantly less popular than the Twitter page and has around 30,000 fans, with messages following a more serious tone. Facebook posts to date have included an image commemorating the anniversary of the D-Day landings and a long post laying out the page’s house rules, which include an "all content must be unclassified" rule. Both the Facebook and Twitter account describe the CIA in the same way by stating: "We are the Nation's first line of defense. We accomplish what others cannot accomplish and go where others cannot go." News comes shortly after Nato’s head of social media Franky Saegerman argued that organisations that ignore the power of social media run the risk of having their agenda hijacked. Saegerman said: "It is critical that you are out in front managing your message so that you do it yourself, if you don’t, someone will do it for you and not always with the best intentions. "Nato needs social media more than social media needs Nato."